It was a really beautiful and COOL night and I wanted to sit on my deck, watch the hummingbirds fight over my feeder and enjoy the rare cool Tucson summer evening with a cocktail. The only problem is, I had not planned a cocktail recipe and hadn't done my usual ingredient shopping. But, you know, I had some blackberries and other goodies and I did have a fully stocked bar. In fact, I'm a little ashamed to admit how fully stocked my bar is! Just so my visitors won't think I have some kind of a drinking problem, I stock most of my bottles behind the bar. Most folks just don't get cocktail blogging at all! But I digress. 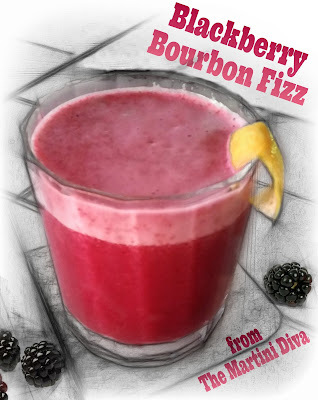 I quickly grabbed those blackberries, a nice little dram or two or bourbon, some blackberry brandy, pasteurized egg white and tossed the whole shebang in my blender. Darned fine little cocktail on the spur of the moment, if I do say so myself. Pour everything into a blender and blend until it’s smooth and thoroughly mixed. Transfer this to a cocktail shaker filled with ice and shake for 30 seconds until chilled and foamy. Pour into an Old Fashioned (aka Rocks or Low ball glass), express the oils from a lemon twist onto the top then drop in the twist and serve. Don't leave off that last twist of the lemon on top of the foam, it masks the raw egg smell that can affect the taste of your cocktail! And quit wriggling your nose at the egg, eggs add a wonderful silky mouth feel and texture to a cocktail that can't be imitated! Trust me and try a few of my other Egg Cocktails too!